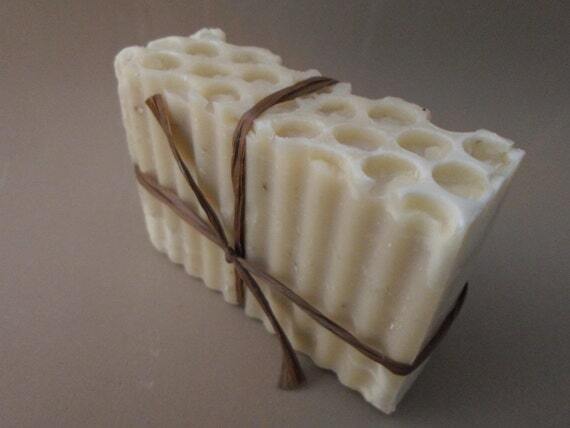 This lovely soap was made by Jean from Soapart. Check out her etsy shop at http://www.etsy.com/shop/soapart What is your favorite item from Soapart? We'd like to know! "Every item I create is Handmade Art from the Heart. Like most Etsyans, I put a lot of love into what I create, and the reason I am here is because I love creating, and I love to share what I create. 1.Tell me a little about yourself. I've been married to my wonderful husband for 30 years. We have 3 grown children. I teach college math online. 2.Where does your inspiration come from when crafting? My inspiration mostly comes from nature, color and scent. 3.Who taught you and how did you learn to craft? My mother taught me to love creating. I learned soap making by reading books, from web based tutorials, from trial and error and lots of practice. I got to go to the national soap making conference last spring, and I get to go again this spring. I learned lots of great things last year and look forward to learning more this year and to networking with other soap makers. 4. Any Specific Tips you have for newbie crafters starting a business in etsy? Do what you love. Make your budget work for you - don't work for it. You may need to make some things that are less enjoyable if they are your bread and butter. But be sure to focus on something fun and creative at least once a week to keep your creativity and passion alive and thriving. Dream big! 5. Name 3 websites you couldn’t live without. 6. What are your 3 favorite shops and why. I have so many favorite shops I can't begin to narrow them down to just 3. Sorry. Etsy is full of so many creative people and shops that I can never see or experience enough. 7. Where do you see your crafting business in 10 years? In 10 years I see my business still growing, with new, fun products being added each year.